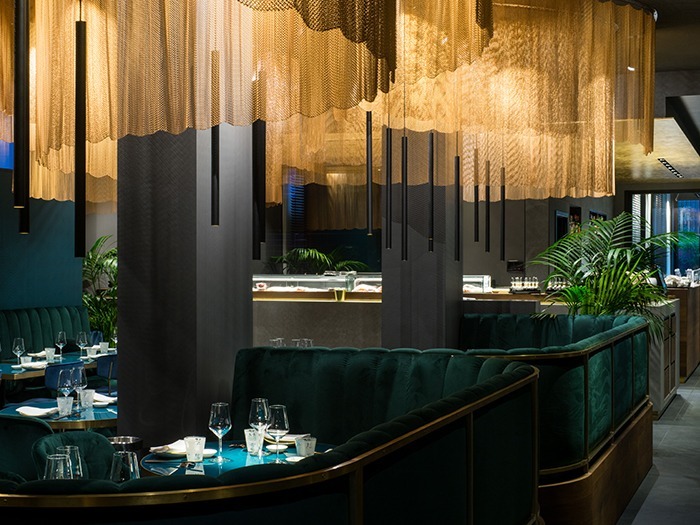 The complete refurbishment of the Milan-based Nishiki restaurant has created an expertly lit romantic setting thanks to lighting solutions by Linea Light Group. The restaurant has a modern and glamorous style that blends Japanese cuisine with Japanese minimalism. The newly installed lighting significantly contributed to the intimate, reserved mood requested by the client. The products selected by Linea Light Group, all equipped with LED and dimmable sources, are managed through a home automation system that allows the creation of different lighting configurations for each individual environment. The project features lighting fixtures with impressive visual impact and discreet lighting fixtures that blend perfectly with the architecture and furnishings. Elegant baton lighting fixtures were placed above the small teal-coloured tables to create an intimate and romantic atmosphere. All the suspensions, in a matt black finish with golden interior, were installed in clusters of three, creating a wave effect. The sinuous shapes in the ceilings are backlit by Pound floodlights for a striking effect. The same projectors were used to illuminate wooden venetian bounds and white curtains that act as partitions between the various rooms. Epitax down lights were seamlessly integrated into the architecture.